Jul. 26, 2013 8:00 a.m. If you are at all interested in song writing, performing, and recording the 3rd Annual Guitar Camp is for you. It will be held from Thursday, August 15th to Sunday, August 18th at the Wetaskiwin Full Gospel Church, located across from the Reynold’s Alberta Museum. The camp will feature Stu G and Bob Bennett as clinicians. Stu G was a member of the band Delirious and currently is a member of One Sonic Society. Bob Bennett has performed with Amy Grant and has written a number of popular songs including "Matters of the Heart," "Man of the Tombs," "A Song About Baseball”. Over the four days you will be guided to develop new songs and on Sunday the songs will be recorded in a mobile studio resulting in a CD to be taken home containing the songs produced at the camp. The tuition for the camp is $225.00. A free continental breakfast is provided with lunch and supper available for $10 day. Free camping is available on location at the Wetaskiwin Full Gospel Church. Please notify the camp for registration and intentions to camp to assist in accommodating your needs. Tenting, trailers and campers are welcome. Space is limited. Onsite water and electricity for camping is limited. A guardian must accompany campers under the age of 12. Founder Tom Cameron stated the idea of Guitar Church started in 2004. His church at the time, asked if he could coach a group of young people to become a youth worship band. The challenge was that all of them had little or no experience playing instruments. At the start, there were 7 of them, both boys and girls ranging in age from 9 to 17. They all learned together and from each other as Tom coached them. Within a year, they were up and rolling, playing in church. 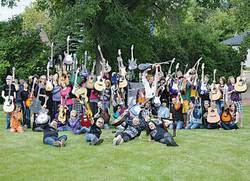 This experience, coupled with an epiphany that came from a guitar clinician encouraging people to start a guitar club was all Tom needed to start Guitar Church.